To combat the chilly bite beginning to linger in the air, I’ve been thinking a little “outside” the box. I – successfully – attempted to remedy the lingering chill last week by popping a pan of cinnamon buns in the oven. That worked for a few days. The initial baking process warmed the front rooms, and the constant reheating – there really is nothing quite like a HOT cinnamon bun – kept us cozy and full. But alas, we woke yesterday to find an empty cinnamon roll tray (apparently this place also came with a little dessert monster who gobbles trays of goodies in the middle of the night and doesn’t put the pan in the sink because SURELY my better half wouldn’t do something like that…) and a cold kitchen that needed some love. Obviously this meant it was time for me to get baking again. This time I decided to go easy on myself and a make a recipe that couldn’t be simpler. Peanut butter blossoms! 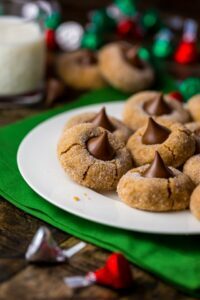 Not only do they reign supreme as king in the cookie realm, but this recipe in particular includes a sugary coating and a chocolate finish. Did I mention these babies need no chill time, include only 5 basic ingredients, and take a mere 10 minutes in the oven? I think you may just fall in love with these peanut butter beauties! Also. 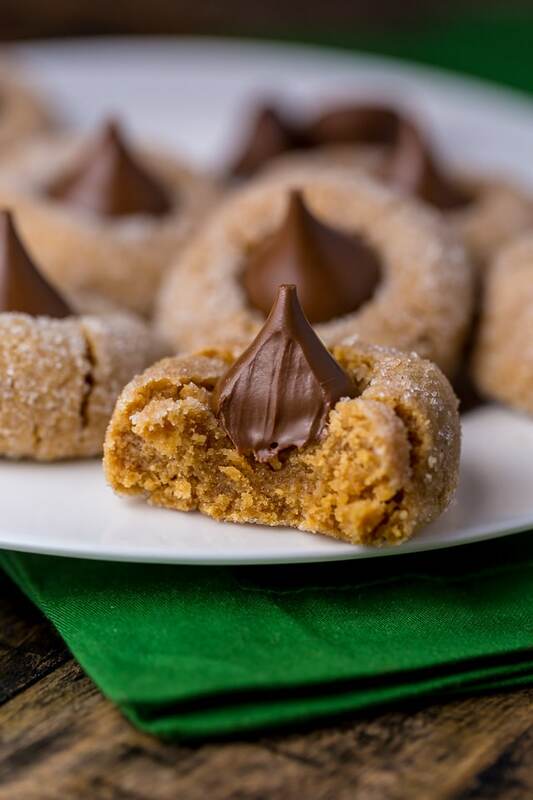 You can choose to top your cookies with a chocolate kiss or a peanut butter cup. So ya know… hooray for options! My mama sometimes makes these and adds chopped chocolate chunks/chips, and that’s pretty good, too. 1) Please do not over bake these cookies! They only need 10 minutes, and although they exit the oven quite soft, they cool on the tray, and really firm up in the process. 3) This recipe makes about one dozen cookies, but doubles effortlessly. So don’t be shy to double up if you’re feeding a crowd. Just be sure to really mix the dough before scooping. This dough does not contain flour, so don’t be afraid to get your hands in there and really mix! Preheat oven to 350 degrees (F). Line a large baking sheet with parchment paper; set aside. In a large bowl combine the peanut butter, 1/2 cup sugar, egg, and salt. Mix well until thoroughly combined. Using an ice cream scoop or 1 tablespoon measuring spoon, scoop out rounds of dough, roll them in a ball, then roll them in the remaining 2 tablespoons of sugar. Place balls of dough on prepared cookie sheet, leaving an inch of space in between each cookie. Place pan in preheated oven and then reduce heat to 325 degrees (F). Bake for 10 minutes. Remove pan from oven, press desired candy choice in the center of each cookie, then allow the cookies to cool on the pan for 10 minutes before carefully transferring them to a cooling rack to cool completely. Love these! It’s totally a peanut butter cookie kinda day! You got me at flourless…. interesting recipe, I will make it! These cookies are so timeless! I love that you put a Reese’s in the middle of some…great call!!! The other alternative to your (lack of) heat situation is coming to visit me in Atlanta! Yay! It’s still 90! Slash, I wish Fall would hurry it on up. Meanwhile I’ll make these cookies and eat them until I forget how hot it still is! Pinned. These look heavenly – I love peanut butter and flourless?! – yes please, i’ll take 10! oh my gawd, peanut butter blossoms are one of my fave cookies . . I can’t believe there’s no flour!!!! love this and can’t wait to try this, Ashley! YESSITY YES YES YESSSS! I wish I could just come over and girl talk and munch on some of these cookies! The fact that they’re flourless is genius-more yummy pb flavor! These remind me of the cookies my mom makes sometimes only she uses 1 cup of sugar instead of a 1/2 c. They do look good though. I’ve been craving those little babies for a while now! These cookies are incredible. I’ll never make the recipe on the back of the kisses bag again. I even forgot the fork step and they are still perfect. Thank you for sharing! Hi Suzanne. This recipe calls for granulated sugar. Happy holidays! These are so easy and delicious! Great for gluten free baking or really just for an after school peanut butter treat. My son loves them and loves making them! Hello, I tried this recipe and its wonderful but when i added the chocolate kisses in the middle when the cookies were hot the chocolate melted pretty fast and lost its form and started melting all over. I tried to put the chocolate after a few minutes out of the oven and it didnt stick to the cookie. What can be done to keep the chocolate kises form as it is without it melting all over? Hi Shoba. I’ve never had that issue. Did you use full-size kisses or minis? Hello, i used full-sized kisses. 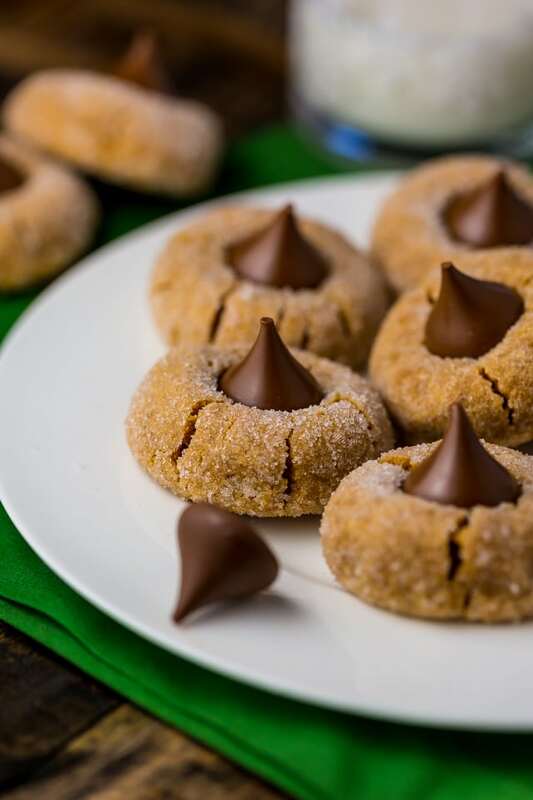 By the time the cookies cool down the kisses melt completely. I only bake for 10 mins and followed all your tips as well.